Michael J. Gion is Executive Vice President and Region Manager for Brookwood’s Southwestern Operations. 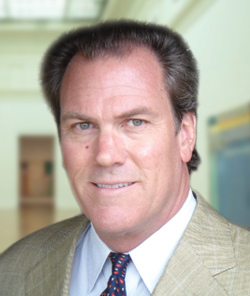 Based in Los Angeles, Mike is a Brookwood shareholder and serves on the firm’s Executive Committee. Also, Mike is among several Brookwood executives who are actively involved with Brookwood's joint venture with Los Angeles based evolve real estate LLC. Mike has a consistent track record of assisting corporate business clients in assuring that their workplaces are both strategic and sustainable assets. In early 2010, Mike Gion merged his Mobius CRE consulting practice into Brookwood. He had previously been with Brookwood, and was part of a project management business unit that was sold to LaSalle Partners by Brookwood in 1998. Mike founded Mobius CRE in 2008 and has provided a range of professional corporate real estate services to clients including MedImpact and SAIC. Mike brings proven leadership with depth of experience in creative and effective utilization of real estate to enhance client’s profitability in a variety of economic and socio/political settings. From 2005 through 2008 Mike served as Intuit’s Site Development Leader for the development of an 1,800 employee corporate campus in suburban San Diego. The project involved the largest lease transaction in metropolitan San Diego in 2005, consisting of 470,000 square feet with a fit-up budget of $80 million. The project has been certified at the Gold level under the US Green Building Council LEED-CI program. From 2000 to 2005, Mike served as the Workplace Portfolio Manager for Sun Microsystems, Inc. with the primary responsibility under original engagement was the land acquisition, planning and development management for a 1.5 million square foot corporate campus in San Diego, as well as smaller development initiatives in Portland, Oregon and other western states. Additionally, his responsibilities included general portfolio management for the Western US and Latin America consisting of 2.3M square feet in 55 locations. Specific activities included strategic portfolio planning, site consolidation and disposition, project design and delivery, site operations, portfolio P&L and business-unit relationship management. From October 1995 to November 2000, Mike served as a Vice President of Jones Lang LaSalle Americas, Inc. In that role with JLL he was senior manager for the Project and Development Group in southernmost California and Arizona, primary responsibility was for the growth and profitability in that region. Specific duties include business development and relationship management, staff management and development, large project delivery and P&L ownership. In that position he directed services to Sun Microsystems, SAIC, Chart House Enterprises, GTE Mobilnet, Chase Manhattan Mortgage, Waterhouse Securities, Ameriquest Mortgage and Union Bank of California. From December 1990 to October 1995 Mike served as Vice President, Corporate Real Estate of California Federal Bank. Prior to 1990 Mike served in corporate real estate management positions with Imperial Corporation of America and Central Capital Development Corporation.